How long has it been since a “Five Things for Friday” post? Too long I tell you! You can see all my other “Five for Friday” posts here! Today I just want to be happy – so I am going to share 5 things that are currently making me happy. Here goes! 1. I know I am late getting on the Hart of Dixie band wagon. (Is there a band wagon?) All I know is that I want to be Zoe Hart, live in Bluebell, and eat in Levon’s kitchen. Is that too much to ask? I only really watch about 1/2 an episode a day – because I really don’t have any free time. But, that 1/2 episode is worth it :). 2. Here’s something you don’t know about me. My husband loves cars. And he loves working on cars. All the time. And so – I have started helping! Two nights ago we did the massive project of removing the engine from one of our cars. We were up late – covered in grease – and pretty mad at the mosquitoes, sirens, and heat. But, the job was done. And, now we (ie. he!) has an engine to re-build :). By the way, it helps if you pretend to be Michelle Rodriquez from Fast while removing engines :). 3. I know I am now a blog designer. And, it might be counter-intuitive to recommend another designer’s offerings. But, I have long been a HUGE fan of XOSarah.com and her awesome site. Today (as she does once a month), she offers “Fix-It Friday”. Basically, for free she gives you one piece of advice to improve your site. Just go to her site, leave a comment with your site URL, and she will respond with one thing to fix. I LOVE this feature and a lot of my fixes have come from her great advice. PLEASE go check her out – you will love it! 4. 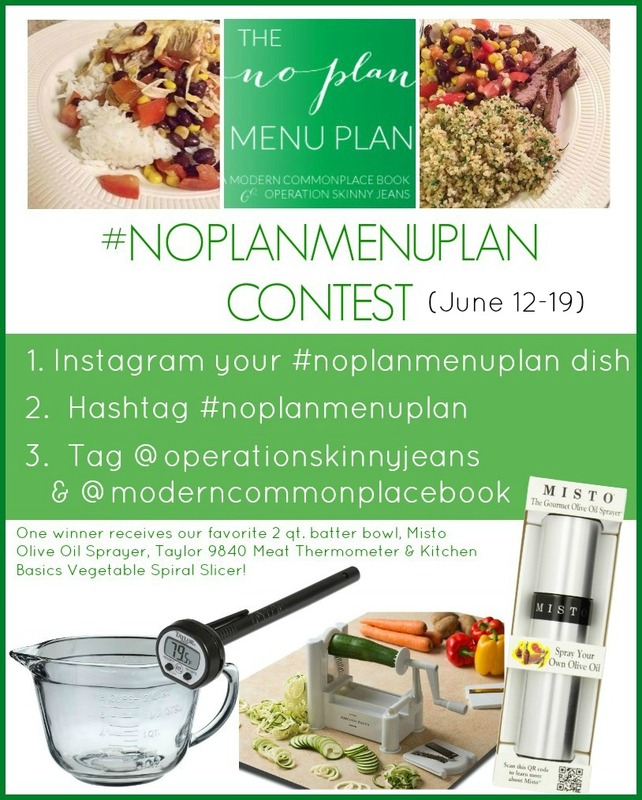 One thing that is majorly making me happy is our new contest for the “No Plan” Menu Plan! Do you use the menu plan? Have made any of our dishes? Take a photo, share it on Instagram (rules here) and WIN! I am really so excited about this. 5. Now, I can’t wait to share my new Blog friend with you – the wonderful Kasi from Birch Juice. You should visit her just to see her gorgeous blog. I love her life. She lives in Nashville – and her photos of her Nashville haunts are gorgeous! I really love her approach to her beauty posts – by offering simple and practical reviews of products (that I actually might buy!). Currently she is helping host an awesome giveaway for $200 in cash! You really don’t want to miss that :). Birch Juice is a personal blog that consists of my day to day experiences. You can often find posts about neat and tasty food that I’ve been eating, as well as reviews for products that I am a fan of. At times you can spot some book reviews in the mix also. Best of my posts, according to me, are my travel posts. I love blogging about travelling because it gives my readers an opportunity to experience something different. I think that those are the most interesting posts. Make sure you follow Kaci and give her a lot of blogging love!